The HP convertible could be one of the very first notebooks shipping with Kaby Lake-G as early as March 26. The Core i7-8705G is expected to be significantly faster than any Intel iGPU solution thus far and rival the discrete GeForce GTX 1050 in gaming performance. The suggested launch price of 2100 Euros, however, could be tough to swallow even for the highly anticipated Intel-AMD platform. HP unveiled two versions of its latest Spectre x360 15 notebook at CES 2018 as detailed in our preview here. The first model is equipped with the Kaby Lake-R Core i7-8550U CPU and GeForce MX150 GPU combo that is becoming increasingly common on newer Ultrabooks like the Samsung Notebook 9 NP900X5T. It's the second model with the unproven Kaby Lake-G Core i7-8705G, however, that has us more intrigued. Finnish online retailer Gigantti recently listed such a configuration as the Spectre x360 15-ch003no for a sale price of 2099 Euros. 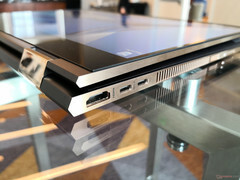 Its product page even includes a ship date of March 26 and other core specifications like the 4K UHD touchscreen, 512 GB SSD, 8 GB of RAM, and the vaunted integrated Vega M graphics. The price and launch date are both notable since HP itself has been elusive on when we can expect the Kaby Lake-G Spectre x360 15 to launch other than a vague H1 2018 time frame. 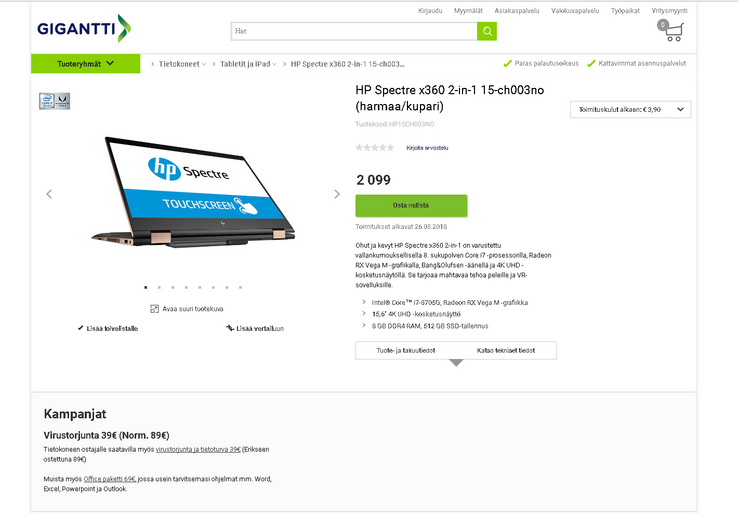 Meanwhile, the 2018 Kaby Lake-R SKU (Spectre x360 15-ch011nr) has been available for weeks directly through HP.com. If the retail listing proves to be accurate, then Kaby Lake-G could be coming a lot earlier than expected. It also suggests that Intel may have more details planned for press prior to March 26 during GDC 2018 in order to prepare the public for the impending Intel-AMD processors. Previously announced systems with Kaby Lake-G like the XPS 15 2-in-1 and Hades Canyon NUC could all be coming sooner rather than later as well. The original listing is linked below, but we've included a screenshot in case the page had been taken down. Users can easily tell the difference between the 2017 and 2018 versions of the Spectre x360 15 since the latter integrates a NumPad for the first time in the series. Special thanks to a reader for the news tip.